Thursday’s much-anticipated Justice Department watchdog report on the FBI’s handling of the 2016 election probes is unusual as a high-profile Rorschach test for partisans with opposite views. But the 500-page opus based on more than 100 interviews and a review of 1.2 million documents is highly typical of an inspector general’s approach in that it lays out methodology using dispassionate prose and a built-in allowance for those individuals accused of misdeeds to respond to a draft of the report. 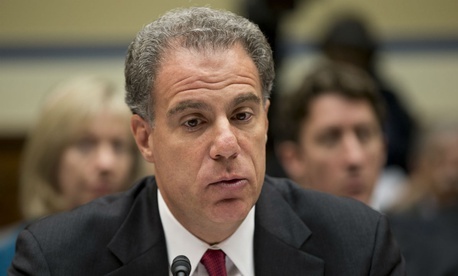 Because IGs pride themselves as nonpolitical and independent of their home agencies, Justice IG Michael Horowitz—who doubles as chairman of the inspectors general council—may take pride in the fact that his report drew praise and was cited by partisans on both sides of the controversial 2016 election. The wide-ranging report puts Horowitz at the center of the Washington spotlight, where he will remain for weeks to come. The IG staff’s year-old examination of the FBI and the Justice Department’s long-analyzed handling of the probe into Democratic presidential candidate Hillary Clinton’s past use of a private email server blasted—as many predicted—since-fired FBI Director James Comey for violating department guidelines that forbid discussing the state of investigations in ways that could influence elections. It criticized a pair of FBI special agents for displaying political bias in private text messages during election season. And it examined the FBI’s prosecutorial tactics—its properly limited reliance on subpoenas and other non-voluntary methods for inducing testimony—and concluded that the bureau acted properly and within guidelines. The decision by Comey to speak publicly and in an opinionated manner of the Clinton probe (in July and again in October 2016) but not of the Trump probe that has since mushroomed has angered partisans on both sides. But the IG report also found that the misconduct of Comey and the special agents was not borne of political bias and did not alter the outcome of investigations. The report, originally promised for March, was delayed repeatedly, most recently, according to reports from Capitol Hill, by President Trump’s desire to see an advance copy of the report on Thursday morning, accompanied by a White House lawyer. Earl Devaney, the retired inspector general for the Interior Department, said he had never before heard of a president reading an IG report in advance. “It’s an extraordinary event, but that doesn’t mean there’s anything wrong with it,” he told Government Executive on Thursday. Typically, IGs work through the Office of Management and Budget’s deputy director for management, he noted, but the president is that person’s boss.